It’s always the heavyweights that garner the most attention. Holyfield, Tyson, Foreman – these are the big-name fights that rake in the national audiences and high rollers. But if you ask someone in the know where to see the most entertaining fighting on earth, they’re likely to tell you to have a look at Thai Kickboxing. Fought by nimble middleweights, these fighters are – just like the Porsche Cayman – potential Goliath-slaying Davids. The 2008 Porsche Cayman is a bantamweight scrapper if there ever was one, with an ideal blend of chassis balance, low mass, power and braking. As such, it has the ability to beat heavier high-horsepower cars around a track. Yet the Cayman is also a remarkably easy car to live with, thanks to a comfortable cabin, civilized everyday driving composure and decent fuel economy. There’s good news for those seeking style too – you can have your Cayman exactly the way you want it, as Porsche offers a plethora of options as well as bespoke custom tailoring. The Cayman’s centralized balance and low weight give it true athletic composure. It also has a surprising amount of dedicated storage space – more than a Honda Accord, according to Porsche – making it an easy lifestyle compromise for those looking for daily versatility in a two-door. The base model Cayman comes off as a bargain, but the 2.7-liter can be a letdown in a drag race. Expensive and practically endless factory options can quickly see your Cayman’s price tag doing its best 911 impression. The most impressive thing about the Cayman is its neutral balance. The mid-engine design leads to a centralized mass within the wheelbase, and the horizontally opposed engine – whose architecture is more than somewhat mind-boggling – keeps the center of gravity low within the chassis. This leads to a car that’s more than happy to change direction with the flick of a wrist, really showcasing its talents through fast side-to-side turns. The steering is sharp and keen to let you know what’s going on at the front-end, while the gear change is crisp and efficient. The standard Cayman’s 245 horsepower can feel a little weedy towards the top-end, which leads us to recommend the 295 hp Cayman S for the optimal experience. The brakes bring plenty of stopping power in either Cayman guise, perfectly complementing the Cayman’s overall balance. After repeated threshold braking minor fade is present, but Cayman S buyers who frequently find themselves visiting the track can opt for fade-free Porsche Ceramic Composite Brakes. The standard Cayman is fitted with a 2.7-liter horizontal six-cylinder engine that produces 245 hp and 201 lb-ft of torque, but the real story lies with the Cayman S, which gets a displacement bump up to 3.4-liters that yields 295 hp and 252 lb-ft of torque. The rear wheels are driven via either a five-speed manual in the standard model or a six-speed manual in the Cayman S. A five-speed tiptronic auto, which slows acceleration, is available as an option on either car. But come on people, this is a Porsche; you’ll want that clutch pedal. Porsche Active Suspension Management (PASM) is available as an option on the Cayman and, in addition to lowering the car’s ride height by 10mm, offers two selectable suspension modes. In Normal mode, the suspension remains compliant and soaks up bumps in the road, but in Sport mode, it stiffens significantly, minimizing body pitch and roll for more nimble handling. The system has the added feature of learning from driver inputs, so if you push hard in Normal mode it will stiffen and will soften up Sport mode if you’ve decided to give the throttle, brakes and tires a breather. For an additional $960, Porsche offers a Sport Chrono Package, which adds an enhanced button-activated engine throttle map that provides more aggressive throttle response across the rev range. In addition, a digital and analogue “segmentâ€ (read: lap) timer is also added. If a navigation package has been speced, the Sport Chrono Plus system can instead be selected which integrates the Sport Chrono timing functions with the digital navigation screen. Due to the use of low displacement six-cylinder engines and its low weight design, the Cayman is not a particularly thirsty creature. The standard 2.7-liter model returns a respectable 20 mpg city and 29 mpg highway, while the increased performance of the 3.4-liter Cayman S nets 18 mpg city and 26 mpg highway. Neither engine will keep the CO2 conscious up at night, as the 2.7-liter receives a ULEV emissions rating and the 3.4-liter is classified as an LEV-II. The interior of the Cayman doesn’t have much in the way of extra room, yet remains comfortable and doesn’t feel cramped, even for tall drivers. The ergonomics of all controls from the pedals to gearshift and steering wheel are superb, and the dash is centered around a large, 911-style tachometer. Partial and full leather interiors are available in a multitude of types and colors. While the Cayman has a definite aura of hardtop Boxster about it – after all that was the initial idea behind the car’s design – it also has 911 cues, which make it unmistakably Porsche at first glance. The Cayman’s curves don’t so much contribute a sense of aggression as they do purposeful design, but an aero package is available for those looking to kick the aesthetics up a notch. The standard Cayman starts at an MSRP of $49,400, and the Cayman S gets a more-than-healthy bump up to a base price of $59,100. This puts the standard Cayman directly up against the significantly more powerful BMW Z4 M Coupe and Audi S5, as well as convertibles such as the Lotus Elise, while the Cayman S out-prices the BMW M3 and approaches the Lotus Exige S. Expensive and endless options – for example $3,210 for tiptronic, $1,990 for PASM – can see Caymans out-pricing Nissan GT-Rs with a few ticks of the pen on the options sheet. 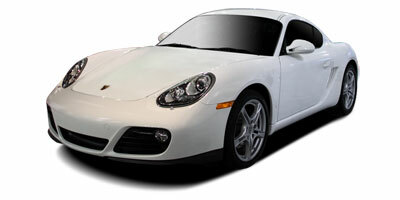 The Porsche Cayman is one of the most nimble, well balanced, fun to drive cars available today. In a world where most manufacturers are cramming more and more horsepower into their cars, not to mention increasing weight, the Cayman is the perfect reminder that more isn’t necessarily better. While the standard model might leave you wanting more power, its abilities through corners and under braking remain jaw dropping. In a perfect world though, you’d go for the S model every time.